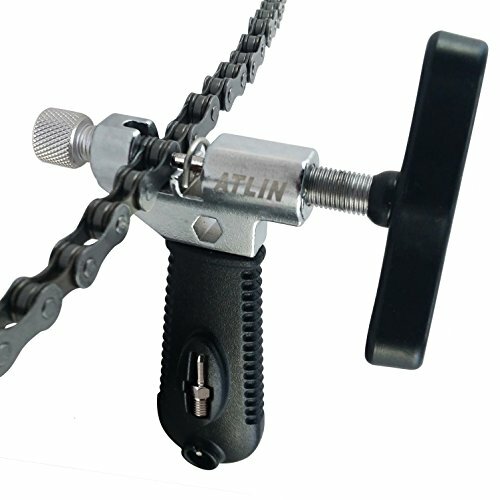 The ATLIN Bicycle Chain Breaker Tool is a must have multi-tool for performing essential bicycle maintenance. This chain splitter tool is specifically designed to remove and install chain pins in 7, 8, 9, 10 and single speed chains. The chain breaker tool also comes with a built-in chain hook for holding your chain in place while performing maintenance. Along with all of these useful features, this bicycle chain tool comes with a spare push bolt, features an ergonomic handle to ensure maximum grip, has been manufactured with durable, long lasting materials, and manages to pack all of this into a compact form factor for easy portability. Instructions are included with the bike chain removal tool.